Online applications for tax credits have been shut down because of abuse by organised crime. HM Revenue & Customs (HMRC) shut down its online portal for the tax credit system late on 1 December after finding a number of fraudulent claims. As BBC News reported in October, organised gangs have targeted the online tax credit system because they see it as an easy target. Tax credits are intended to help people on low incomes or with families. The identities of staff had also been abused, HMRC said. The staff in question work for the Department of Work and Pensions, raising questions about whether DWP systems have been hacked or whether insiders have been assisting in the fraud. A helpline has been set up to counsel staff who think they have been affected. "As soon as we noticed there was fraud taking place, we brought the system down," an HMRC spokeswoman said. "Like any big organisation, we take fraud very seriously." Applications in person, by post or over the phone are still being accepted. 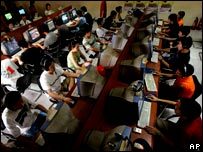 BBC News learned in October of widespread fraud by organised crime, with multiple online applications being made from internet cafes using false identities. The fraudsters then disappear before repayment can be demanded - leaving honest claimants to bear the brunt of overpayment recoveries. The problems with fraud in the tax credit system are thought to result from the system's design, described by some fraud experts as "low-hanging fruit" for scammers. In the past, most checks into error or fraud have been applied after an application is made, in order to claw back overpayment after the fact. The clawback process has sparked criticism for leaving needy families short of cash. But it also leaves the system open to abuse. Overall, the tax credit system paid out £13.8bn in the financial year which finished in April 2005. No figure is available for the proportion which was overpaid that year - either through error or fraud - but in the previous year, overpayments totalled £2.2bn.